Survey findings and analysis are presented within RWCO industry-wide survey, entitled “RWCO’s Public Sector Procurement Barometer 2019.” This research examines industry trends, best practices, assumptions and market factors within the public sector. It provides public-sector contractors with reliable benchmarking data from which to assess their individual performance against their peers. Leesburg, VA, February 19, 2019 --(PR.com)-- Richard Wagner and Company (RWCO), a business strategy, business development, and proposal consulting firm based in the Washington D.C. metropolitan area is pleased to announce the release of its annual survey of over 30,000 companies engaged in Government contracts. 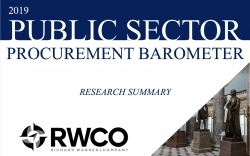 Survey findings and analysis are presented within RWCO industry-wide survey, entitled “RWCO’s Public Sector Procurement Barometer 2019.” This research examines industry trends, best practices, assumptions and market factors within the public sector. It provides public-sector contractors with reliable benchmarking data from which to assess their individual performance against their peers. * More than 55% of respondents find that non-price factors, such as technical solution, key personnel, and past performance, drive the award decision. * Information Technology and Professional Services organizations operating in the Federal contract arena enjoyed an anticipated win rate of nearly 50%. While surprisingly, more than half of all respondents within the defense sector wrestled with win rates below 25%. * Survey of executives across various industrial sectors found that 7 out of 10 Federal contractors experience a bid success rate of 30% or less. For context, a simple web search of industry chatter on “win rates” suggests the historical benchmark for acceptable performance is about 45%. This demonstrates a significant gap between the competitive bid realities for public sector contractors in the past decade when compared to historical metrics of success. “This Barometer provides organizations with a sanity check of their performance across both their core industry and other industrial sectors within the Federal domain, thereby serving as a reference point for strategic planning, resource allocation, and the optimization of business development processes,” said RWCO Chief Executive Officer Richard Wagner. Richard Wagner & Company (RWCO) is a business strategy, business development, and proposal consulting firm headquartered in the Washington, DC, metropolitan region. The firm was founded to assist businesses in navigating the complicated and hyper-competitive process of winning business within public and private markets, to include Government sectors and regulated markets.